This zucchini is incredibly delicious with a little bit of a Mexican kick from the jalapeno then topped with melted queso blanco. It’s also easy and quick, a must try! You MUST try this! I only made a few tweaks using less oil, and and rather than making a cilantro pesto, I added Garden Gourmet cilantro paste and minced pickled jalapeno for kick. It totally exceeded my expectations. Cook the garlic in oil in a large skillet over medium heat 1 minute, stirring until sizzling. Add zucchini and cook stirring occasionally, about 3 minutes or until slightly softened. onion and cook about 3 minutes. Remove skillet from heat and add cilantro paste, jalapeño and lime juice. Season with salt and pepper to taste and top with queso blanco. Serve hot. This was so delicious! I can’t wait to make it again! I only had fat free feta in the fridge, so I used that instead of the queso blanco. When I put it in the WW recipe builder, that changed to points from 4 to 1 point! Thank you for your fabulous recipes. You are my go-to for healthy eating. My husband loathes zucchini, but we had one in the fridge and I thought I would test this recipe. It did not disappoint! Great flavour and even my husband liked it. What kind of alcohol pairings would go well with this dish? Red wine? So I made a HUGE feast for Cinco de Mayo and wanted a lighter veggie dish to compliment the rich and heavy dishes. Wow, this recipe was SUCH a winner, I can’t get over how delicious the combination was together. I did add 2 ears of fresh corn just after the zucchini, which added a nice sweetness. It did take closer to 7 or 8 minutes for the zucchini to soften. I will absolutely be making this again, thanks so much. Would this be good as leftovers? I’ve eaten it the past two days as leftovers and it’s still delicious! I think if you know ahead you’ll have leftovers, I’d likely keep the queso and cilantro aside to add them fresh. Queso fresco is a fresh cheese not an aged cheese. Pot cheese or farmer’s cheese works too. This recipe looks more Italian than Mexican. Just to add a jalapeno does not make it Mexican. Even so, I am sure this is a good side to traditional Mexican dishes. Our Mexican family does not eat a lot of hot peppers or hot spicy food or garlic. Many Mexican families do not. Some good Mexican spices to use are fresh cilantro, cumin, oregano and chile powder or mild chile if you want more authentic flavors. Adding squash blossoms would be a spectacular and delicious addition. We stuff them and fry them but they would be good in this recipe too. Is this used as a main meal? Made this last night and it was fantastic. I had a lonely jalapeño in my fridge so I looked up a quick pickling recipe – this one from Allrecipes was great: http://allrecipes.com/recipe/221961/quick-pickled-jalapeno-rings/. The pickled jalapeño added a really nice kick….don’t skip it! I used queso fresco , which was delicious (like a cross between mozzarella and feta). This was super easy and quick to make, and was a wonderful side for grilled chicken fajitas. Love it! 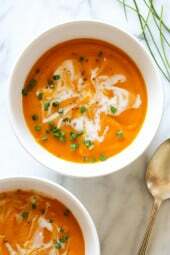 I love your blog, cookbook and meal planner! Thank you for helping me stay on track, its hard for a die hard foodie!! Thank you! Can you tell me which part you are referring to? I think she’s referring to the below paragraph! 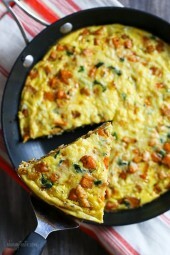 This looks wonderful, making it for dinner tomorrow night!! My mom's boyfriend made this over the holidays…and I thought it looked familiar then found it on here! I've made it myself since and it was so good. Is impressive as a side for company too (like to serve with chicken marinaded in a tequila-lime marinade). dear lord this is incredible. it by FAR exceeded my expectations. i added black bean and roasted chicken. I also used fresh jalapeno. i cant wait to eat it again. thank you so much for this amazing recipe!!! I'm sure I've reviewed this before, but we had it again tonight with chicken enchiladas. My husband raved about the zucchini, commenting at least three times how good it was. I love having an alternative to rice and beans. Thanks again for sharing. Made this tonight and absolutely loved it! I added some frozen corn and veggie (Quorn) crumbles – simply delicious! The pickled jalepenos just make it!!! Thanks for another great and yummy recipe! I adore this recipe! I can't find queso blanco in the Netherlands so I use feta, but I could eat this every day, hot or cold. Is the serving size 1/4 of the recipe or 1/4 cup??? Made this last night. I added a diced sweet potato and cooked that first. I also had 1/2 of a white onion. I had feta, lime and fresh cilantro so followed it step by step from there. Very good! This would make a great quesadilla. Guess I know what's for dinner! Fantastic! I've been making this every night this week! I have been omitting the cheese, adding in celery and using fresh cilantro instead of paste. It's delicious! I found cilantro paste in the produce section and the Queso Fresco (in round plastic package marked "Fresco" in the regular block cheese section of my regular Publix grocery store. Where did you find th cilantro paste? What do you suggest as a replacement to cilantro? Made this last night for my family and it was so good! While making it I wasn't sure it would have a lot of flavor, but it did. Used Cotija cheese instead of Queso Blanco, but otherwise followed recipe exactly. Perfect for an easy, healthy side dish. I made this recipe last week, it was so good! I used feta instead of queso blanco too and it was fine. Thanks for the recipe! Yummy!! I think I'd like to try adding the black beans and maybe mushrooms next time. I couldn't find queso blanco so I just used reduced fat Mexican blend. I made this as a side to the Slow Cooked Sweet Barbacoa Park. Delicious! I added a chopped whole avocado with the cheese. Wish I had read about adding black beans because they would be perfect for a vegetarian main entree! I just made this and i actually put it in taco shells! This was so good! There wasnt a bite left. Health food is food considered to be beneficial to health in ways that go beyond a normal healthy diet required for human nutrition. Love all this veggie goodness Gina! Looks delicious! My husband made this the other night and it was fantastic!!! We used fresh cilantro instead of the paste. We will definitely make this again. I had feta, so I made this go greek- fresh mint, lemon juice Cavenders greek seasoning and feta, yum! Can't wait to get some queso blanco or fresco to make it this way. I have plenty of zucchini to experiment with! My family has made a dish similar to this only we used fresh jalapenos and add sliced mushrooms. We topped with monterey jack cheese. So good, the broth is so good too, I save and add it over brown rice. This looks spectacular, as always Gina. I'm including it in a collection of Weight Watchers friendly zucchini recipes I'll be posting Sunday. Can't wait to try it. It's nice to know there are other cookbook addicts in the world! I don't think I'll ever get over it. Extremely tasty…!! I had used instead of fresh onion red basil and left away the lemon. We will have it again!! Are pickled jalapenos what is typically on salad bars at the supermarket? I don't really like spicy food, and don't want to buy a whole bottle. But would try what is on salad bar and slowly add to recipe. I wonder if adding black beans and corn would work with this, or is that too much? I think I'm making chicken tacos with this as a side dish tomorrow night, sounds delicious! I made it with black beans and corn also, it makes a lot! 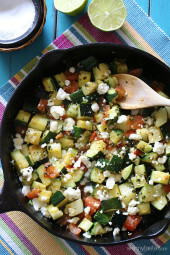 Making this right now, with Feta. I was going to get queso blanco, but it was high $$$ for how much I was going to use. Besides, I love feta. A Mexican chain here puts feta on their nachos and they're amazing. Do you think the Garden Gourmet Italian Herbs paste would work in this recipe? I hate cilantro, so I need an alternative herb. I made this dish last night and it was fantastic and delicious! I was a bit skeptical with the Garden Gourmet Cilantro Paste, but it was a great fresh taste and now I don't have to worry about a fresh bunch of cilantro going bad. Have you experimented with any of the other Garden Gourmet selections? I have used the basil and the ginger, in addition to the cilantro, all with great results! I bought a spicy red pepper one (can't remember what it's really called) but I haven't used it yet. They're so convenient! Thanks for the tip, Carol! Shelley, I've used the Lemongrass paste and it works amazingly well! I love the idea of the lemongrass since it's not easy to find. It's great to keep on hand in a pinch when you don't have fresh herbs. I know what you mean about cookbooks, my collection is actually quite ridiculous, but I figure there are worse addictions! I just found your blog, and I'm so glad I did! 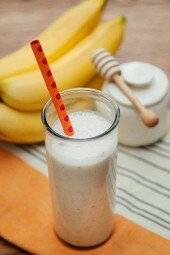 This and many of your other recipes look delicious! I agree!!! I have some left over Queso fresco from the AMAZING corn soup and have zucchinis from the neighbors garden.. so I cannot wait to try this!!! Fresh cilantro from the garden too… great idea for taco or tortilla wraps.. and would add shredded chicken for the protein. Gina has become my #1 resource for excellent recipes. As far as I know I can't get hold of any of those cheeses in my city (Brighton, UK). What alternatives do you suggest using? Cheshire/Feta? Yummy! I'm always looking for inventive zucchini recipes. This looks beautiful! Wow, I made this tonight after searching for zucchini recipes because we were getting tired of eating it one way. Everyone loved this recipe it's definitely a winner. Thanks!!! This looks delicious! Would you think I could use squash instead of zucchini. I have a ton of squash I need to use! Thanks! I made it with all squash and it was wonderful! Thanks for this recipe! Delicious! 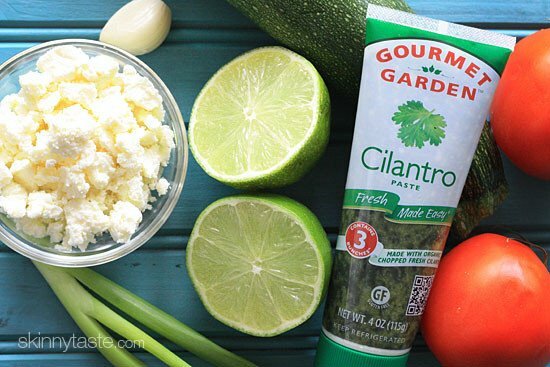 How could the cilantro paste be made instead using the tubed version? Just use fresh chopped cilantro. Such a scrumptious, easy and colorful Mexican side dish! This looks so delicious, Gina. Keep the zucchini recipes coming! I have an over abundance of them right now. yum!!! My mom just gave me a lot of zuchinni's over the weekend! I'm definitely making this for dinner tonight… 🙂 Mexican Style! I'm Such a huge fan of your recipes Gina! Just when I thought you couldn't come up with another way to use a zucchini – bam! You are magic. I can't wait to try this! Thanks! I got my queso blanco at Whole Foods if that helps the people that are looking. It was near the specialty cheeses but not in the same case. It was in an 8oz block I think. I have leftover from the corn soup she posted a couple weeks ago (also amazing!). It is no where near as salty as feta can be but has a similar consistency. If you use feta you might want to cut back on the salt a little. Can't wait to try this! 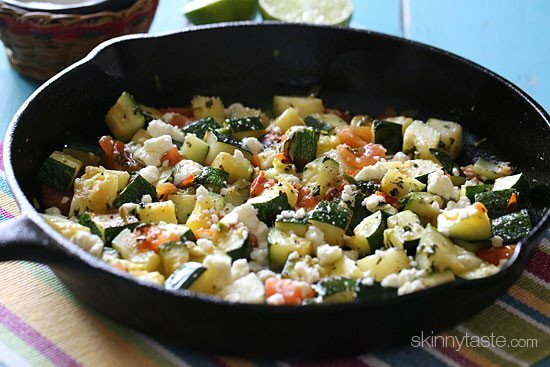 I love zucchini and am always looking for meatless entrees to switch things up. Would use this for taco filling too. Can't find "queso blanco" here in the Northeast…any substitution suggestions? Feta maybe? Thanks! I found it at walmart, I'm in the midwest, but I'm sure they'd have it where you are. They didn't have it with the feta cheeses or regular cheeses, they had it near the "special" cheese section, hopefully that helps! Sure feta is probably the closest. I got mine at Costco, just an FYI! I love new zucchini recipes, since I've tried just about all that I have right now. I had to double check this, because I was saying to myself "I know I've made this from her before.." then When I read Aaron Sanchez I remember I got it out of a magazine and we LOVED it! I will definitely have to try your version too!! Queso blanco is white cheese. Any type of white cheese?? Or you can use cotija, or queso fresco. What is queso blanco ? 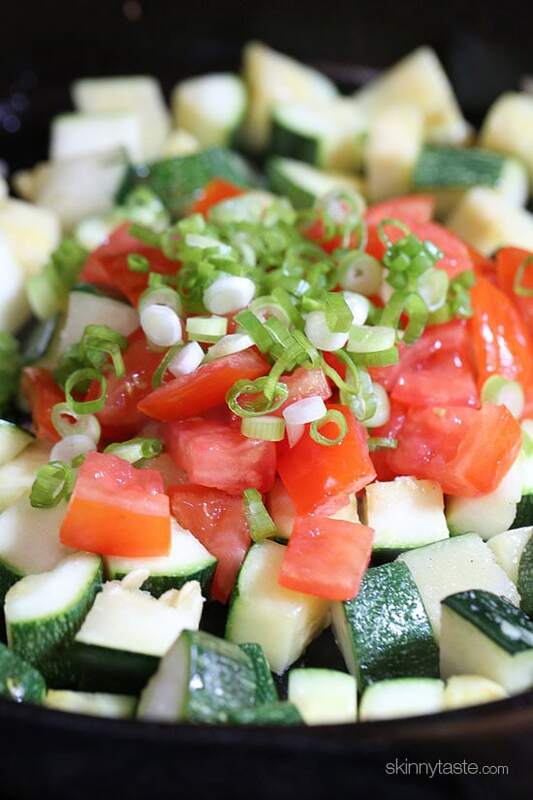 This sounds incredible– Zucchini is one of my favorite vegetables to serve as a side. So versatile! This looks incredible and healthy! I think it would make a good egg scramble too! Thanks for sharing! Looks delicious! Can the queso blanco and cilantro paste be found in regular grocery stores (e.g., Ralph's) or should I go to a specialty/Latin market? The herbs are available in the supermarket, or you can use fresh. I just happened to have the tube. The queso blanco I got at Costco, or any Latin market would have it. Or you can use Cotija or queso fresco. If you wanted, what type of meat would you add to this? I would serve this with grilled chicken or pork chops. OMG this looks sooo good. Quick question: Is the pickled jalapeno something you can buy, or do you make it? I can't say as I've noticed that one on the shelves with the pickles. Is it the kind you buy to put on nachos, in a can? Yes, in a glass jar buy the pickles. I like to buy them because they last a while so I always have them when I need to add kick. Any spicy pepper would really work. I actually met Aaron Sanchez once at a blogging event I attended, and he was a cutie! Love the sound of this, bookmarked. That's so cool Kalyn! I'm going to make it my business to go to his restaurant.